Pivot hinges generally attach to the top and bottom of a door. You'll find here both light-duty to commercial grade heavy-duty pivot sets. Many pivot hinges allow the door to open in both directions and return automatically to the closed position. Our Sliding Door Edge Pull and plates for non-latching doors are as exquisitely and finely crafted as its operating locks, and are made of the same beautiful and rugged materials. For a quality, beautiful look, PMW door accessories cannot be beat. PMW mission is to satisfy the higher expectations of today's homeowners with regard to door locks. They strive to provide a broad and interesting range of products that consumers can use as elements of decor, and not just as a way to latch a door. 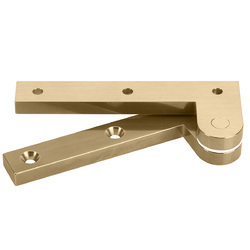 Solid brass size: 3 7/8" x 3/4"
Intermediate Pivot Hinge Use with Pivot Hinge for Large Doors. 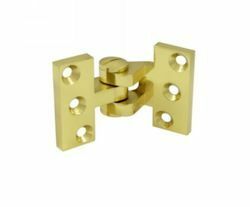 Solid Brass Intermediate Pivot Hinge, Pair. PMW offers offset pivots for architects, builders, and homeowners in diffrent sizes. We manufacture in India & export these items worldwide. The Pivot Hinge are built with the highest quality brass material. Our brass pivot are machined for high strength & quality. These hinges are designed for overlay doors, where one part is mounted on top and the other on the bottom of the door, resulting in a concealed hinge. These are available for both light weight and heavy duty usages. The key advantage is that this hinge doesn’t block the door to be opened in both directions and being mounted at the far ends, they allow a seamless view. Offset pivot hinges are used on flush fitting doors when the cabinet door is required to swing free of its frame and are particularly useful on cabinets with slide out drawers and shelves. The design of these hinges ensures that only the pivot of the hinge is on show when the door is closed. Pivot doors have an ability to direct space, unlike many other types of doors. This series of them creates a stunning vertical design element that both defines and blurs the line between inside and out. Ideal for Simple Flush Edge Pullers where locking is not important. Supplied with finger pull for use in the leading edge of the door. Suitable for both 35mm and 44mm doors. 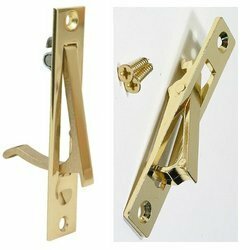 Looking for Pivot Hinge Brass SS ?